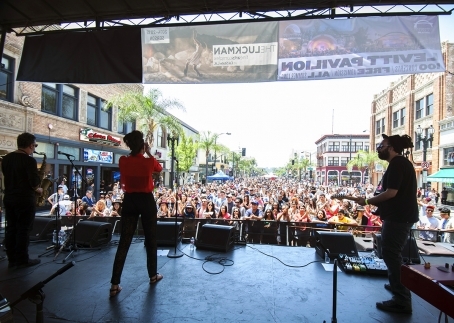 LA County's kickoff festival is here: Make Music Pasadena is happening tomorrow, June 6th, with over 150 bands playing at the heart of downtown Pasadena! Along with main stage big-timers like Kishi Bashi, How To Dress Well, Sir Sly, Nick Waterhouse, and rising stars Jr., Kera & The Lesbians, and Autumn in June, music & arts collectives around the county will also curate some of the tastiest home-grown acts. The main stage activities end with Pasadena Symphony & Pops' grandeur performance, but these side venues will be going strong late into the night. All Scene Eye presents two live stages at Armory Center for the Arts: check out Kat Myers & The Buzzards, The Electric West, Draag, Holland Belle, Tashaki Miyaki, and more. Sherpa Music MGMT, One Question Sessions, and De La Vie TV presents at Old Towne Pub: DARK FURS, Crystales, Sanglorians, LA Takedown, Le Cos, and more. For Friends Of Sound presents at Der Wolfskopf in the evening: OYLS, Kid Bloom, Slow Graffiti, GDNA, and more. Montecito Music and Media presents at Shoppes at Stats: Shattered Skyline, Cool Face, The Wild Reeds, Valley Queen, bed, and more. Open Kanvas presents at Club 54: Veteran Assassins, Noah V, Kennis Clark, Born Allah, and more plus a surprise headliner.